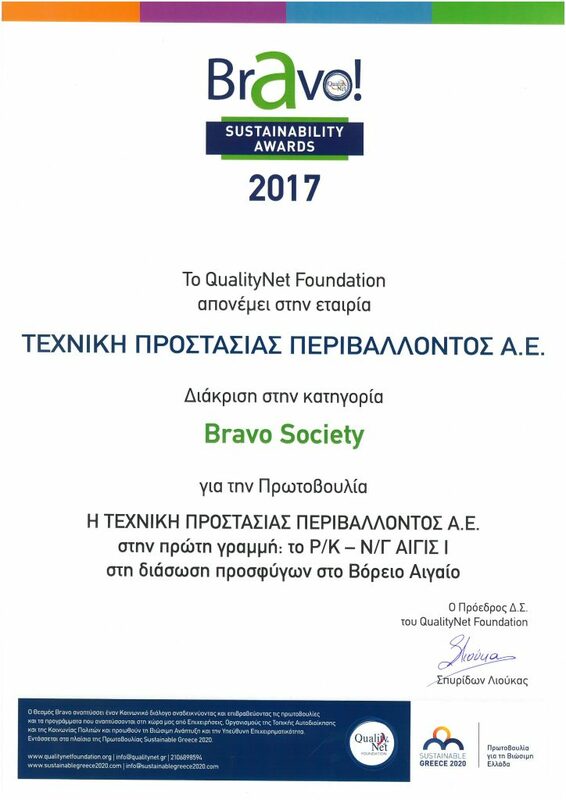 Environmental Protection Engineering, as part of the initiatives that contribute in creating the Greece of tomorrow, participated in Bravo Sustainability Awards 2017 and won the "Bravo Society" Award for the provision of the tug-salvage-antipollution vessel AEGIS I to rescue refugees in distress at sea. This year's event, which took place on the 25th of May 2017, at Athens Concert Hall, entitled "We create together the Greece of the tomorrow", focused on the initiatives and programs developed by Enterprises, Local Government Organizations and emerged through an innovative dialogue among 200 social partners and over 10,000 active citizens, which demonstrates how Greeks seek a better future and look for initiatives to achieve it. Mr. Ioannis Polychronopoulos, Chairman and Managing Director of EPE SA received the award of this honorary distinction, and claimed "The testimony of each of the 1868 people from Syria, Afghanistan and Iraq that were rescued by the crew of AIGIS I, the sincere and public expression of gratitude of the local community of Chios and Oinousses as well as of the Port Authority, was the reward of our decision to offer to this humanitarian crisis.". The decision on the allocation of AEGIS I, able to respond to major pollution incidents, resulted from the need to supplement the significant daily effort of the officers of the Coast Guard and the Department of Marine and Island Policy for the rescue of refugees, despite shortages in supplies and human resources. Responding to this need, EPE mobilized the vessel to undertake a different mission, in order to contribute substantially to Greek shipping. “We could not ignore the largest refugee crisis that turned the sea of our country into a deadly trap for thousands of people. Beyond our desire to help our fellow citizens in this desperate journey they were forced to make knowing the risks, we have an obligation as a Greek company to help our country which is facing one of the worst humanitarian crises of all times.” added Mr. Polychronopoulos. The humanitarian operation of AIGIS I, from December 26, 2015 to February 15, 2016, resulted in the rescue, first aid, psychological support and safe transportation to the logging centers in Chios, 1868 fellow human beings from Syria, Afghanistan and Iraq, Among them hundreds of children, always in excellent cooperation with the local Port Authority of Chios. The humanitarian operation of AEGIS I resulted in rescue, first aid, psychological support and safe transport to registration centers in Chios, of 1868 of our fellow citizens from Syria, Afghanistan and Iraq, including hundreds of children. During our stay in the region there was no loss of human life. The presence of the vessel in the area cultivated a sense of security to the local community of Chios and Oinousses, the Port Authority and other Humanitarian Organizations officially operating in the region. Bravo Institution is part of the Sustainable Greece 2020 Initiative and develops a social dialogue highlighting and rewarding the initiatives and programs developed in our country by Enterprises, Local Government Organizations and Civil Society and promoting Sustainable Development and Responsible Entrepreneurship. Please find here the Press Release in Greek. Left to right: Ms. Helen Polychronopoulou, Vice Executive President, Mr. Ioannis Polychronopoulos, President and Managing Director, Dr. Vassilios Mamaloukas - Frangoulis, Director of the Marine Environment Protection Department, Ms Irene Vitsara, Marketing & Communications Executive and Mr. George Artemakis, Surveying Engineer N.T.U.A, Marine Environment Protection Department of EPE S.A.